Using freeze dried bananas, as substitute for fresh bananas, is a crunchy twist on this classic recipe. The best part is – no need to worry about browning bananas! 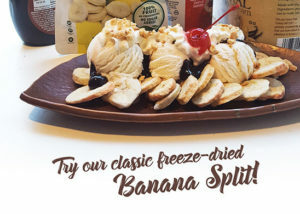 Try our Ultimate Freeze Dried Banana Split anytime, we know you will LOVE it! 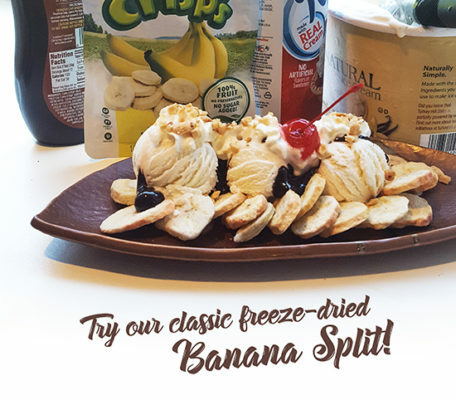 Use freeze dried bananas in place of fresh bananas to get a crunchy twist on this classic banana split recipe. 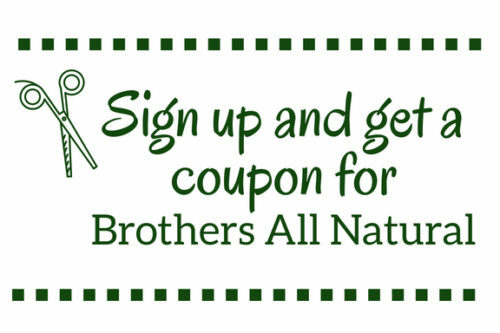 Try The Ultimate Freeze Dried Banana Split! Get 3 scoops of ice cream and put them in a row on a plate or in a bowl. Take your banana fruit crisps and place them as desired on top of the ice cream. Drizzle chocolate sauce, add whipped cream, add toppings such as peanuts and then finish off with a cherry!